Near the start of “Nine Moments for Now,” the riveting exhibition at the Cooper Gallery at Harvard University’s Hutchins Center in Cambridge through Jan. 21, is a hall of black and white photos of the dead. The images depict funerals of assassinated civil rights leaders Martin Luther King, Malcolm X and Medgar Evers in the 1960s and funerals for African Americans killed by police in recent years: Sandra Bland, Michael Brown (“ground zero for what we now know as Black Lives Matter,” curator Dell Marie Hamilton says), Freddy Gray. 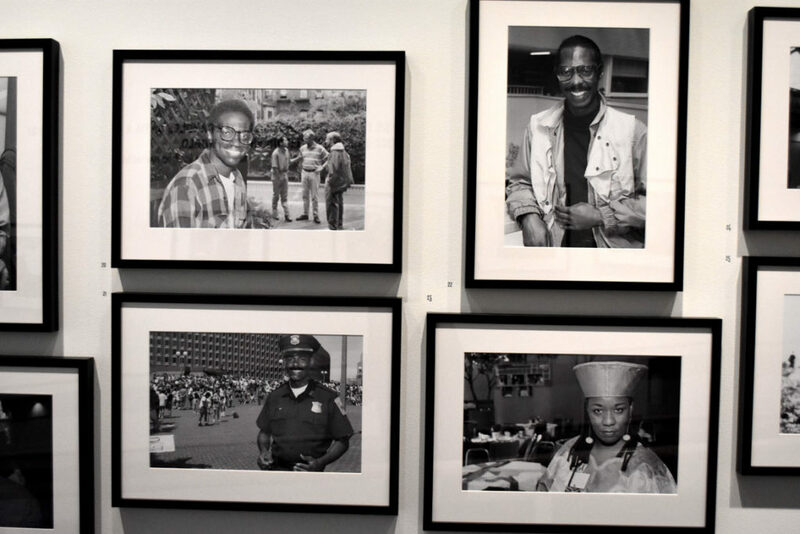 Boston photographer Craig Bailey offers “Faces of the AIDS Crisis,” portraits of local activists in the 1990s who have since died from HIV or AIDS, Hamilton says. 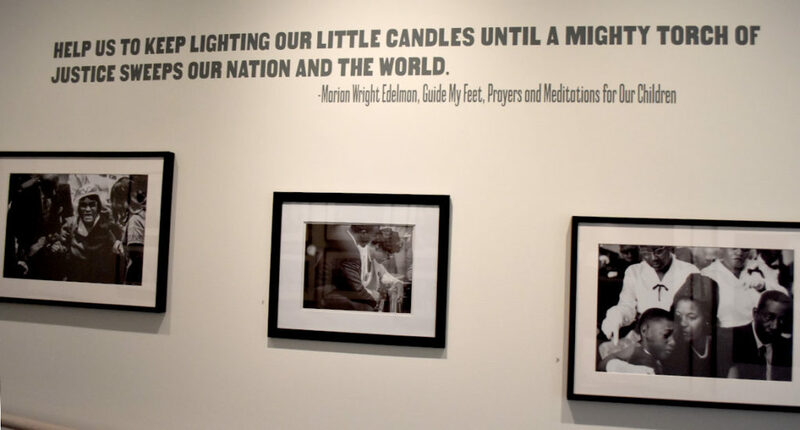 And Carrie Mae Weems’s 2008 photos from her “Constructing History Series” are pietas reimaging the deaths of Evers, King, Malcolm X. It is a halting, haunting place to begin—invocations of the African American community’s monumental losses. 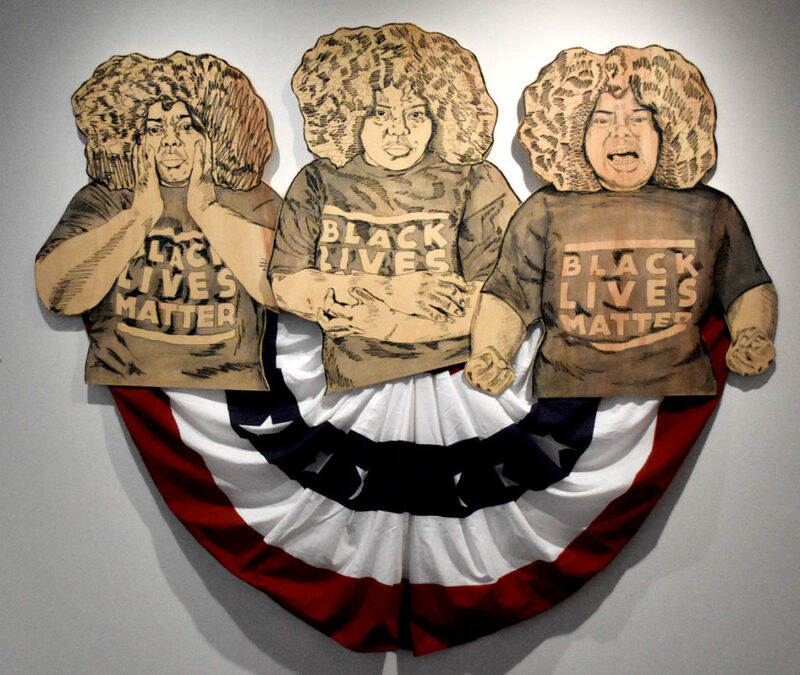 “In the wake of #BlackLivesMatter and #TimesUp, we hope that this exhibition enables all of us to slow down long enough to remember that democracy, time and memory are as poetic, unruly and fragile as body and breath,” Hamilton, a Boston artist, writes in the exhibition booklet. She’ll lead tours of the show on Dec. 20 and Jan. 11. Craig Bailey’s “Faces of the AIDS Crisis” photos 1991-1997. 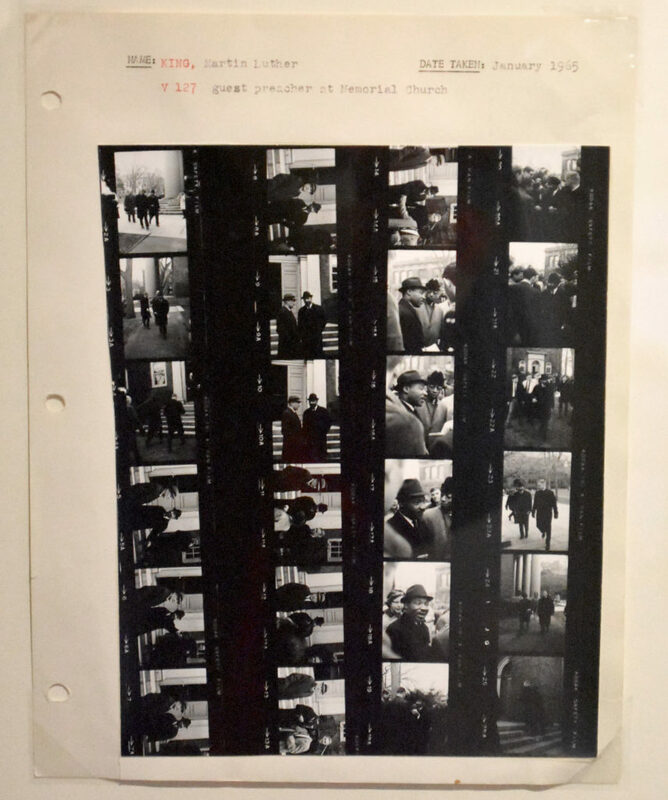 Photographer unknown, “Martin Luther King, guest preacher visiting Memorial Church, Harvard University,” January 1965. Obama is part of a section of heroes—W.E.B. Dubois’s Harvard student photo from 1890 (“before they were giants,” Hamilton says); Carl Van Vechten photos of stars of the Harlem Renaissance during the 1930s and ‘40s (James Baldwin, Zora Neale Hurston, Langston Hughes, Jacob Lawrence, Richard Wright, Alain Locke), Martin Luther King photographed during a 1965 visit to Harvard; a 1977 photo of writers Alice Walker, Toni Morrison and June Jordan from Jordan’s archive. 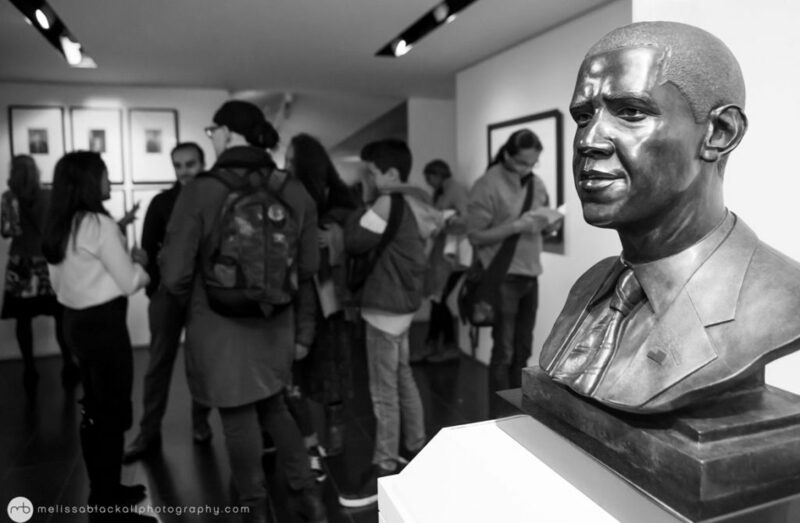 “Nine Moments from Now” at Cooper Gallery. 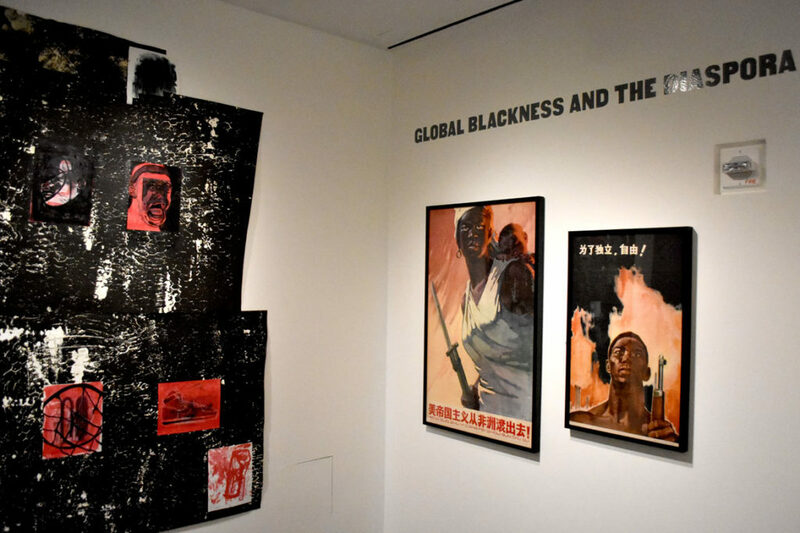 From left: Marlon Forrester, “BlackSunsetComing,” 2018; Wu Min, “US Imperialism Get Out of Africa!,” 1964; Zhan Jianjin, “For Indepedence and Freedom,” 1962. Next are posters—Shepard Fairey’s iconic graphics of Obama from the 2008 presidential campaign; screenprints from 1969 by Corita Kent (after she’d left Los Angeles for Boston) about black poverty, Cesar Chavez, and mourning the death of Martin Luther King; vintage posters promoting the Chicago black artists collective AfriCobra and calling for a black studies program at Harvard. There are Chinese propaganda posters from the early 1960s saying “US Imperialism Get Out of Africa” and “For Independence and Freedom,” as well as reproductions of posters from the 2016 Women’s March. Ekua Holmes, “Idyll of the South: Root of Jesse,” 2016 (left), and “Idyll of the South: Portrait of Aunt Mary,” 2018. 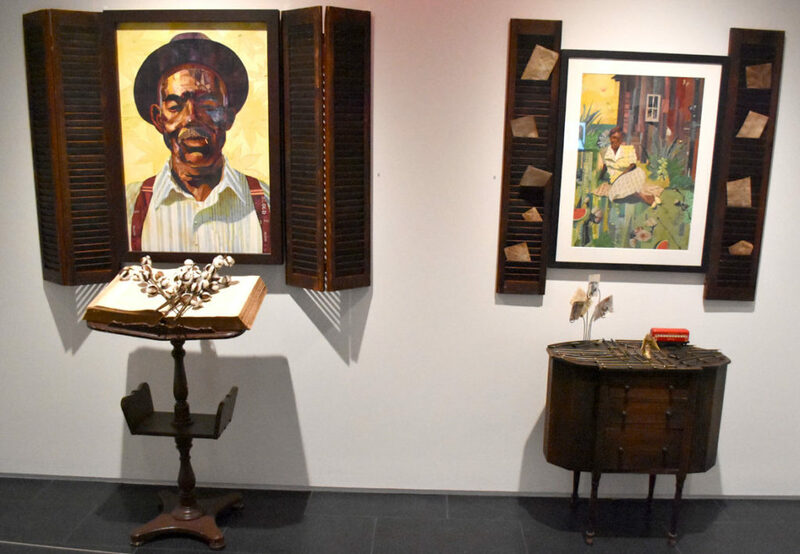 “Nine Moments for Now” showcases many Boston-area artists: Steve Locke’s “Auction Block” abstract paintings based on the shape of the locus of slave sales; Ekua Holmes’ shrines to family members; L’Merchie Frazier’s textiles honoring 19th century Boston activist Frances Ellen Watkins Harper and Black Panther Ericka Huggins; Joy Buolamwini’s “AI, Ain’t I a Woman,” a digital piece interrogating racism built into artificial “intelligence” programs. Other local folks in the show include Alexandra Smith, who teaches at Wellesley College; Elisa Hamilton; Evelyn Rydz; Marlon Forester; Chanel Thervil. “What does winning look like?” Hamilton asks in the show’s brochure. Chanel Thervil, “Pity Party: Selfies at the Start of the Trump Era,” 2017. 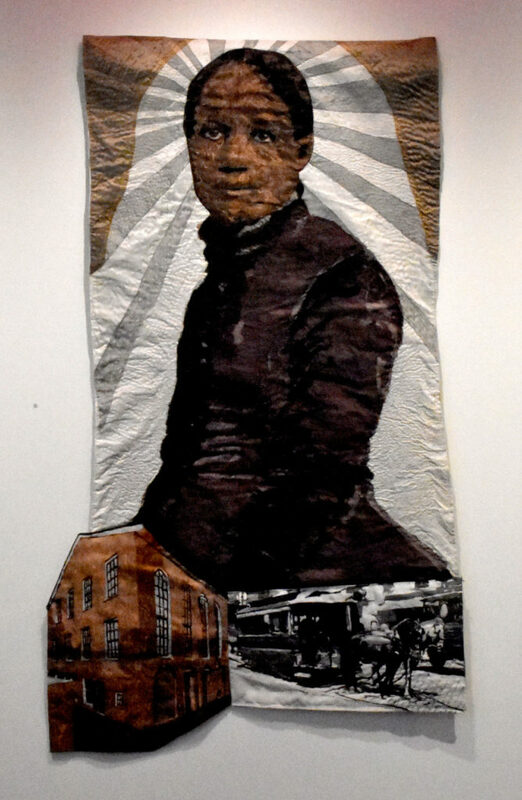 L’Marchie Frazier, “Frances Ellen Watkins Harper,” 2018.